At the Hawk Conservancy Trust, our priority when you come here is that you enjoy yourselves! This is why we’ve thought long and hard about our approach to education and how we make sure that you, as a visitor, can find out as much or as little as you like during your time here. Our staff have a huge passion for what they do. You’ll see them about the Trust throughout the day and they’ll happily stop for a chat and answer any questions you have. We believe that education is a key part of conservation. The more information you are given about the work we do and the importance of looking after the birds of prey we have here, then the greater chance we have of you being inspired to protect them. Our flying displays have been specially crafted over the many years that the Trust has been open. By being able to see our birds in action as they swoop close to your head, you’ll get a better understanding of their role in their natural habitat. We combine this with a fun, informative live commentary which explains what the birds are doing and why. 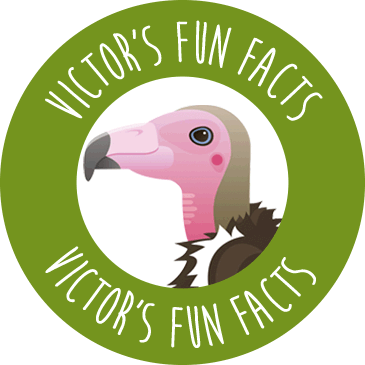 We’ve carefully designed our signs to include important information in a way that’s easy to see and read, whether that’s finding out where in the world a specific bird or animal is from, to just how endangered it is and why. Above all, you play a key role in what we do here at the Trust. We’re a registered charity and rely on our visitors to help us achieve our mission – the conservation of birds of prey. 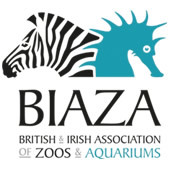 We believe in engaging with our visitors personally to both show our appreciation and to tell you what your support is doing to help protect these birds, not only here but all over the world. We look forward to meeting you! The Hawk Conservancy Trust can help bring education to life inside and outside the classroom. By working with teachers and schools, we’ve been able to create a number of tailored education packages at our award-winning visitor attraction. These have been designed to complement your term’s topics and work with the National Curriculum covering Key Stages 1-4. 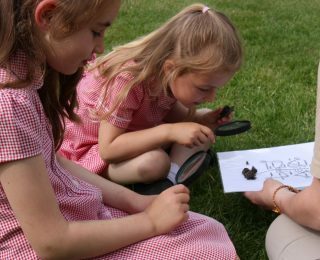 Through our education packages, we provide teachers with an exciting opportunity to actively engage their students with the natural world. Combining classroom work with discovery based learning, we bring topics to life, inspiring creativity and interest. A huge part of the experience when visiting the Trust is to watch our thrilling flying demonstrations. This is why all activity sessions are pre-arranged with teachers and the Trust’s Education Officer, Miriam Nicholls (CertEd), to ensure visits maximise the learning experience and have an itinerary which enables activities and demonstrations to be incorporated into the visit. A day at the Hawk Conservancy Trust is a wonderfully interactive learning experience offering pupils the opportunity to be immersed in nature for the day. Education is a fundamental element of all the work the Hawk Conservancy Trust does in the visitor centre and on a daily basis. Sharing our passion and expertise is fundamental to extending our other core missions of conserving and rehabilitating birds of prey. This extends to the highest levels of education and we regularly host training courses for a variety of external organisations and in collaboration with tertiary education bodies. 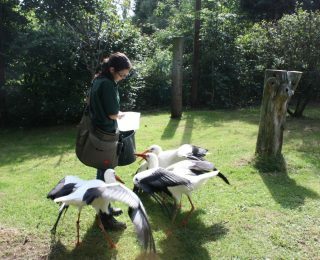 The Trust regularly hosts training courses for students, at the Royal Veterinary College and University of Reading, studying the BSc in Avian Science, the MSc in Wild Animal Biology and the MSc in Wildlife Management. In addition, we host courses for fifth year veterinary medicine students who are following the avian medicine elective. With the breadth of expertise offered by our team, along with our state-of-the-art rehabilitation facilities, the training and education that we are able to offer these students is highly specialised. There are also opportunities for students to gain a variety of hands-on experience working with our resident birds and within the National Bird of Prey Hospital™. For many years, the Trust has worked closely with the RSPCA, hosting the annual intake of trainee inspectors. 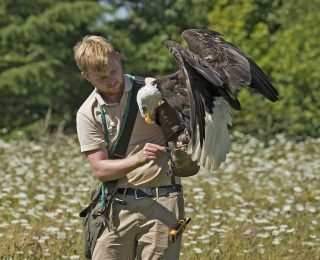 These trainees visit the Trust for in-depth training with birds of prey, to ensure they are confident with handling and restraining birds of prey as well as having a greater understanding of their specific health and welfare issues. Each year we offer, in collaboration with Amews Falconry, the opportunity for guests to gain the nationally recognised LANTRA qualification in bird of prey management and husbandry. 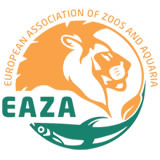 This four day course is offered bi-annually and has the option of an assessment to achieve the LANTRA award. The course is designed to teach the beginner, with little or no knowledge, how to prepare for, source, select and care for birds of prey. Read more about the LANTRA Beginning Falconry Award Course. A number of opportunities are available for students (aged 16 or over) seeking work experience. Applications should be made 8 – 10 months in advance and should be for a minimum of 2 weeks. 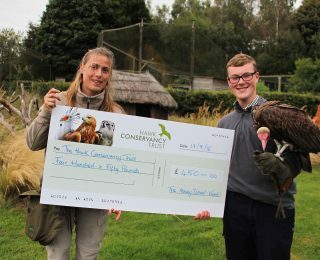 The Hawk Conservancy Trust offers a limited number of apprenticeships in Work-based Animal Care in association with KEITS. Black-chested Buzzard-Eagles have nests made of sticks and these almost always located on isolated and inaccessible rock and canyon ledges.